Understand the health benefits from integrating better ventilation and outdoor rooms with a building’s interior. Identify the aesthetic uses of consistent sightlines and product styling in creating a seamless profile for a perfect match. Discuss multi-panel door system materials and components and their environmental, sustainable, and energy benefits for a project. 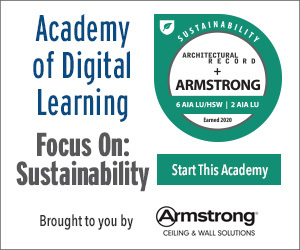 Realize the importance that proper installation has for a building’s sustainability. Recognize environmental ratings, such as NFRC and LEED, and how multi-panel door systems can help to meet these standards. Why must we think of home and nature as distinct, or even opposing, spaces? For the health of both home and nature, a marriage between what lies within the edifice and the space outside is critical. Bringing the outside into a structure enhances indoor air quality (IAQ), ventilation, natural daylighting, and the health of occupants. Taking into consideration the natural surroundings when adding a structure means creating minimal ecosystem disruption and preserving as much of the environmental balance as possible. The best design does not stand in opposition to nature; instead it facilitates cooperation and the elimination of perceived boundaries. 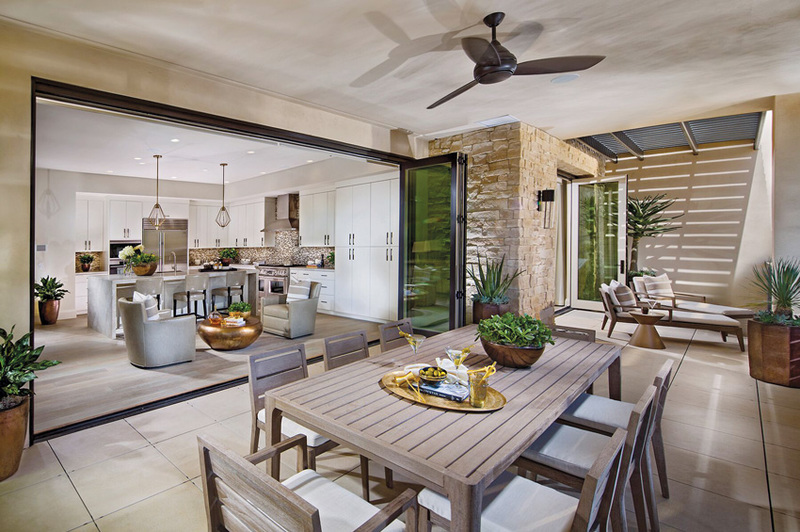 By their very design, multi-panel door systems enable an unbroken engagement between interior and outdoor spaces. A multi-panel door system is a door or window structure with multiple operable panels that open sequentially to create a large opening, spanning an entire wall or beyond. Reaching beyond the capability of a traditional hinged door, multi-panel systems don’t just transition between indoors and out. Instead, the wide and seamless openings they furnish blend the exterior space into a room or series of rooms, eliminating the perceived divide. Not only do multi-panel door systems improve important health metrics, such as indoor air quality and daylight exposure, as enhancements in manufacturing and technology have augmented door and glass efficiency, these systems can occupy a greater area in the building envelope without compromising overall energy performance. Multiple-panel door systems, or multi-panel systems, are composed—as the name implies—of multiple panels. The way in which these panels operate gives the system type its name. The common types of multi-panel door systems are folding and multi-slide. Multi-slide doors may be further divided into stacking multi-slide or pocketing multi-slide. 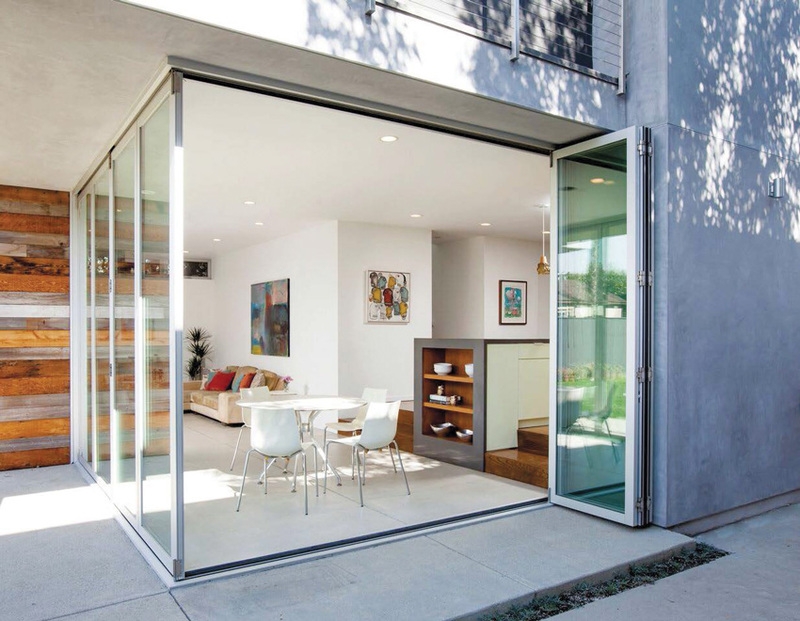 In a multi-slide door, panels stack together within the opening. They may either stack to one side when fully open, divide and stack to either side of the frame, or be stacked and contained within a pocket framed into the building’s wall, out of sight. Multi-slide glass doors are generally used to create large openings in walls, or to take the place of an exterior wall altogether. The size of the panels and the total door unit can vary and may be custom fabricated to suit a particular building project. Usually, it is the glass itself that imposes limits on the size of each individual multi-slide panel. The number of individual panels can vary to meet the dimensions of the desired opening. The configuration of multi-slide door panels can be designed so that all panels stack behind each other on one side of the opening or so that panels are split to stack on both sides of the opening. There are two basic options for how the individual panels appear when stacked. The first option is to keep one glass panel fixed, or stationary, and to slide all adjacent panels to stack evenly behind this stationary panel. By using this option, some manufactured designs, when fully stacked, appear to be a single panel when viewed from the inside or outside. The second option is to conceal the sliding panels, when open, in a wall pocket. In this style, the sliding panels disappear altogether, giving the appearance of an unimpeded opening in an otherwise solid wall area. Furthermore, multi-slide doors need not be limited to a single wall plane. Manufacturers have developed methods to allow doors to meet at a corner location, eliminating the need for a post or frame element. When open, the corner literally disappears, allowing a full visual and physical three-dimensional connection between outdoors and inside. When fully closed, the door panels come together to form the corner. Not only do multi-panel door systems create a borderless transition between interior and exterior spaces, certain manufacturers offer perfect match design platform, creating consistent sightlines across all windows and doors regardless of their operation, whether folding, sliding, or swinging. Stile and rail symmetry and consistent sightlines are a critical design element creating balance in large-panel, open-space systems. In today’s evolving home designs, larger openings that maximize space and natural daylight have grown in popularity, making open space products one of the focal points of the design. Narrower frame profiles and taller doors allow for more glass, more light transmittance, and a cleaner aesthetic. 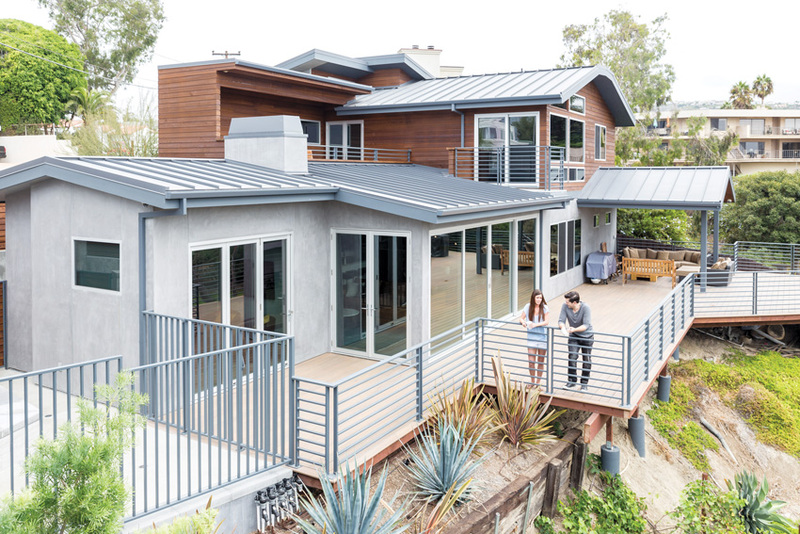 In large, sweeping floor plans, different openings that may call for dissimilar products types often fall side by side, unfavorably highlighting the variances in symmetry. Perfect match resolves this design concern by using a single, signature door panel across folding, sliding, and swing door systems, thereby providing a complete and perfectly matching door package that is naturally pleasing to the eye. Innately, people have an instinctual sense to assess the level of balance achieved within a space. Balance and symmetry are vital when creating open space products, allowing the flow of design and borderless transitions to march unbroken between structure and surrounding ecosystem. By utilizing the same panels throughout, a designer can achieve consistent sightlines and product styling for the perfect match. This unified transition of perfect match profile mirrors the seamless blend between indoors and out. In a folding multi-panel door system, panels stack perpendicular to the opening when fully opened. As with multi-slide systems, folding system doors may stack to one side when open or can divide and stack on both sides of the opening. The folding action mimics the expansion and contraction of an accordion. The panels may be inswing or outswing, depending on design preference and use. Folding glass doors may either be floor mounted or top hung, with top-hung systems the preferred method. In a top-hung folding door system, the top track carries the weight of the doors and the floor track serves as a guide. Precision bearings and rolling hardware are used to operate the door. The frame must be secured to an adequate header with minimal deflection when the doors are installed. The structural support required and header size depends both on the weight of the doors and the surrounding structural conditions.